The medical device sector has lagged behind the pharmaceutical industry in its use of social media for promotional purposes. Lessons learned from the first steps of pharmaceutical companies can serve the medical device industry in navigating social media tools to satisfy regulatory requirements and promote effective marketing campaigns. With the emergence of interactive, real-time Internet communication and social networks, medical device companies now have access to new methods for engaging patients, developing strong clinical relationships with hospital and physician customers, and providing a vehicle for patients and customers to connect with one another. Before 2009, pharmaceutical companies began using media tools such as Google AdWords, YouTube, social networking sites, and microblogging to promote prescription drug products. These means of communication may have limitations. On the surface, they seem to conflict with established regulatory labeling requirements. Recent enforcement actions by FDA are shaping the use of digital media channels for the companies they regulate. For a variety of reasons, the medical device sector has lagged behind the pharmaceutical industry in its use of social media for promotional purposes. Lessons learned from the first steps of pharmaceutical companies can serve the medical device industry well. The Division of Drug Marketing, Advertising, and Communications (DDMAC) regulates advertising for prescription drugs. The regulations mandate that prescription drug advertisements cannot be false or misleading or omit material facts. They must present a balance between benefit and risk information. Regulation of medical device advertising, on the other hand, is split between CDRH, for restricted devices, and the Federal Trade Commission (FTC), for all other devices. Generally, Class III, some Class II, and Class I devices are restricted by FDA. Advertising is distinct from product labeling, both of which are governed by FDA. Although FDA and FTC are legislated separately, the intent of the regulations is the same. It is generally good business practice to follow the more-stringent FDA guidelines regardless of device classification. Under the Federal Trade Commission Act, advertising must be truthful and nondeceptive; advertisers must have evidence to back up their claims; and advertisements cannot be unfair. Section 502(r) of the Federal Food, Drug, and Cosmetic (FD&C) Act provides that a restricted device is misbranded if any of the advertising pertaining to the device does not contain a brief statement of the device’s intended use and relevant warnings, precautions, side effects, and contraindications. In addition to the differences in regulatory agencies and compliance language, pharmaceutical companies are required to submit to FDA copies of promotional materials for prescription drug products at the time of initial dissemination and medical device companies are not. By 2004, the agency had released two draft guidances on similar topics, the first covering broadcast advertising over television and radio and the second covering help-seeking and disease awareness communications. Disease awareness communications are communications to health care practitioners that discuss a particular disease or health condition but do not mention any specific drug or medical device. Help-seeking communications are analogous communications directed at consumers. By 2009, the pharmaceutical industry was extensivly using search engine marketing, also known as keyword ad buys, and other Internet-based media tools to promote prescription drugs. These forms of advertising generally presented an abbreviated message or graphic to a user with a clickable link to additional information. The industry had adopted the standard of a 1-click rule, which held that as long as warnings, side effects, and other relevant information were no more than one mouse click away from the main promotional content, then FDA regulations for a balanced presentation of efficacy and risk were satisfied. FDA emphatically disagreed in the form of 14 warning letters sent to pharmaceutical companies, effectively shutting down most efforts to use Internet technologies for prescription product promotion. FDA promised that a guidance document on the use of the Internet and social media for product advertising would be issued in 2010. If a patient submits a question regarding a drug or device via Twitter, how is it possible to present balanced information on indications, risks, and benefits, given the 140-character limit? Subscription services enable users to post comments on a company’s Web site, over which the company has no editorial oversight or control. If misinformation is posted on a promotional site for a medical device, is it the company’s responsibility to address it? Medical device companies are required to report adverse events to FDA. If unidentified patients post comments on adverse events on a Web site not controlled by the medical device company, is that company required to report the event to FDA or attempt to contact the patient? In early 2011, FDA announced that it would not, in fact, issue any guidance on social media marketing. Instead, the agency has been communicating policy through continued enforcement actions against companies pursuing marketing campaigns that fall short of the existing regulatory requirements. For example, recent warning letters include one sent to a pharmaceutical company over patient testimonial videos deemed false or misleading because they overstate the efficacy of the drug and minimize the serious risks of the drug product. Was this a disaster for all pharmaceutical companies? Not at all. The FDA warning letter outlined a technical problem involving how the ShareThis widget used preexisting meta tags (see sidebar on ShareThis widget). Meta tags do not affect how a Web page is displayed, but rather provide information about who created the page, what the page is about, and which keywords best represent the page’s content. Search engines also use meta tag information for building their indices. Possible Worldwide, an interactive company with many pharmaceutical clients formerly known as Bridge Worldwide, has worked directly with ShareThis (the company that created the widget) to craft an FDA-compliant product using technology known as open graph protocol (http://opengraphprotocol.org). Now, the ShareThis widget pulls specially constructed compliant content (visuals, links, descriptions) from this protocol. The path to use a device on or in a patient can be longer and more complex than for a prescription drugs perhaps requiring multiple consultations with surgical specialists or preoperative imaging procedures. Patients have less control over treatment options when devices are used, whether it is a system for performing a minimally invasive surgical procedure, choice of a bare or drug-eluting stent, model of pacemaker, or manufacturer of a continuous positive airway pressure (CPAP) device. Devices often have a very short product life cycle and may be single-use, as in the case of an implant. Only a subset of devices (e.g., insulin pumps and CPAP machines) lend themselves to improving compliance and health outcomes through social media as a means of constant communication between medical device companies and patients. However, the emergence of drug-device combination products may lead to increased adoption of devices. Figure 1. Patterns in Respondents’ Trust in and Use of Sources of Health Information, 2002–2008. All odds ratios were calculated for the trend between 2002–2003 and 2008. Adapted from the New England Journal Of Medicine. New media has a lower cost of entry to reach patients directly. However, direct-to-consumer marketing has not traditionally been a part of medical device marketing strategies. It may be helpful to visualize traditional direct-to-consumer marketing tactics as looking for a needle in a haystack—the needle is the patient and the hay equals consumers. Patients’ widespread use of the Internet for research and social media channels to find communities has changed the communication model. For example, there is a Web community called www.patientslikeme.com, which has recently expanded to include discussions on all conditions. Companies can now find entire target patient communities—a stack of needles, if you will. The costs associated with finding and engaging these collections of patients is reasonable and saves resources associated with consumers who are exposed but not relevant to the message. Traditionally, medical device companies were forced to trickle down their technologies through physician customers. Now medical device companies can directly inform patients about treatment options as they are searching on their symptoms and conditions. 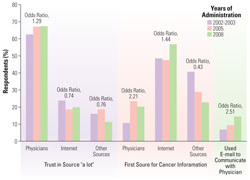 A paper in the New England Journal of Medicine examines trust readings and actions by patients with a cancer diagnosis.3 These data reveal that trust in the information gained via the Internet grew significantly as a first source of data from 2003 to 2008 (see Figure 1). Such analysis reinforces the idea that the Internet is a primary source for education and information and plays an important role in the healthcare decision-making continuum. Given the difficulties faced by the pharmaceutical industry in pursuing Internet and social media campaigns while maintaining regulatory compliance, medical device companies may wonder why they should bother. They may also wonder how to proceed and what is possible. Despite the vagueness of current regulatory guidance, it is possible to conduct effective social media campaigns that maintain compliance. The best way to think about these new communication channels is to categorize them as media. However, they have a different rule set for engagement than traditional channels. Traditional media is unidirectional (from the company to the target). Social media is a conversation that depends on back-and-forth participation. Compliant content can be leveraged into these channels providing the company with a voice in the conversation. Developing the policies to post and respond to individual comments and reactions can be as simple as filing a well-reasoned authorization document in the quality system. Remember to include language that points to the existing adverse event and complaint reporting workflow processes. Avoiding mistakes is as simple as sticking to approved device labeling, presenting balanced risk and benefit information, and backing safety and efficacy statements with labeling and clinical data. Treat social media as any other marketing channel. Start with understanding the audience needs. Determine message tones and brand characteristics you want to highlight and pull together assets that work for each channel. Write authorization documents. Look to libraries of past campaigns that are FDA compliant. Here’s a wiki with examples: www.doseofdigital.com/healthcare-pharma-social-media. Review recent FDA warning letters available on www.fda.gov and participate in regular FDA-hosted online reviews of enforcement actions. Ensure that the company’s current Web site provides a rich user experience, is fully functional across a variety of browsers, loads quickly, includes a ShareThis functionality, and is optimized for mobile devices. Jonathan Richman, group director, strategic planning for Possible Worldwide, maintains a blog with posts on critical marketing issues (www.doseofdigital.com). Ed Bennett, manager of Web operations at the University of Maryland Medical Center, maintains a list of social media channels used by hospitals (http://ebennett.org/hsnl). Lee Aase, director of the center for social media at the Mayo Clinic, provides excellent self-help instructions (http://socialmedia.mayoclinic.org and http://social-media-university-global.org). BW Hesse et al. “Trust and Sources of Health Information,” Archives of Internal Medicine 165 (2005): 2618–2624. SA Rains “Perceptions of Traditional Information Sources and Use of the World Wide Web to Seek Health Information: Findings From the Health Information National Trends Survey,” Journal of Health Communication 12 (2007): 667–680. Additional places to find data are fan pages and groups in Facebook, as well as relevant search terms in Twitter. Communities formed around bloggers discussing their diseases can be found by searching Technorati (http://technorati.com). The Internet and social media are pervasive aspects to modern culture and modes of communication. Medical device companies should be prepared to take advantage of these avenues to create better products and benefit patients. Barriers to entry for direct access to patients in need of medical technologies have dropped dramatically. Maintaining regulatory compliance is challenging, but it is possible if device firms use appropriate customization of the available tools and pay careful attention to language. Marketing campaigns integrated across multiple communication channels can be effectively implemented. It’s time for medical device companies to leverage these new opportunities. 1. “Public Hearing on Promotion of FDA-Regulated Medical Products Using the Internet and Social Media Tools” (Washington, DC, November 12 and 13, 2009). Available from Internet: http://www.fda.gov/aboutfda/centersoffices/cder/ucm184250.htm. 3. Bradford W. Hesse, Richard P. Moser, and Lila J. Rutten, “Surveys of Physicians and Electronic Health Information” New England Journal of Medicine 362, no. 9 (March 4, 2010): 859–860. John Bashkin is principal for Bashkin Consulting (Fremont, CA). Debbie Donovan is marketing and sales consultant for eGold Solutions (Mountain View, CA).